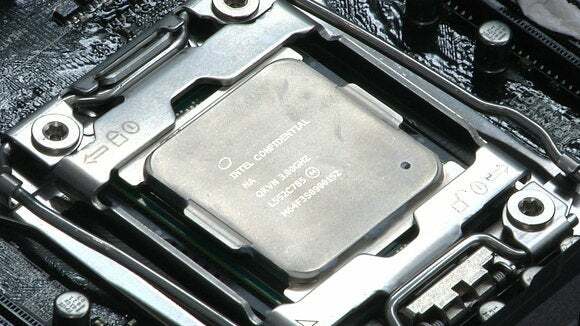 Intel's new 10-core Broadwell-E gaming chip is only a few hours old, but already overclockers have pushed a 3GHz version of the chip to 5.7GHz and they say they're only just getting started. Overclocking is the process by which software commands and extreme cooling are used to push processors to run faster than they are typically designed to run -- the chip equivalent of putting your foot on the gas and flooring it while keeping your car under control. 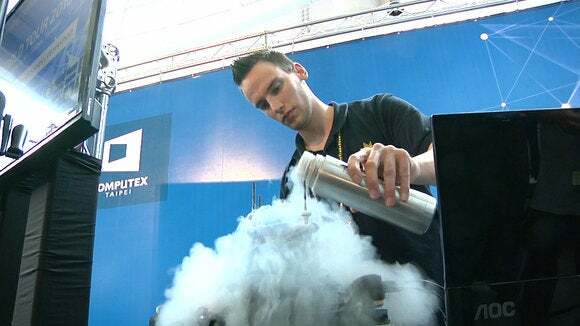 At an overclocking event at the Computex trade show in Taipei on Tuesday, large tanks of liquid nitrogen stood on the ready to help overclockers keep the processors cool. An Intel Broadwell-E chip at Computex in Taipei on May 31, 2016. Roman Hartung, a product engineer from Berlin's CaseKing, was pouring some of this into a container vessel on top of a Broadwell-E chip. The chip was running at around -110 degrees Celsius, which is the coldest the chip will run, he said. Any colder and it shuts down. The demonstration was using the Core i7 6950X variant of the Broadwell-E, one of a number of new chips in the family that was announced by Intel on Tuesday at the same event. He had the chip running at about 5.2GHz but said he had previously pushed it to 5.7GHz. Hartung said the chip showed strong gaming performance, beating out Intel's previous Haswell-E gaming chip that could actually be pushed faster. "Even if we can only run these chips at 5.3GHz, it still beats Haswell-E running at 5.8GHz," he said. "Even with 500MHz less, the performance is better. This means the efficiency training [Intel] did is quite good." 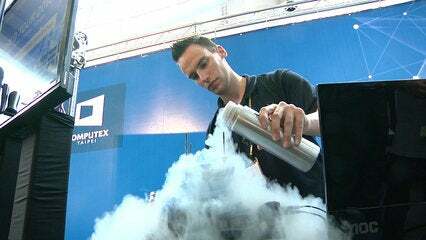 Roman Hartung, a product engineer from Berlin's CaseKing, pours liquid Nitrogen onto a Broadwell-E chip during a demonstration at Computex in Taipei on May 31, 2016. Another overclocker who goes by the name "LeeghoofD" said he hopes the new Broadwell-E chips will help them beat all the previous overclocking records, many of which were achieved on 8-core processors. "We should break all the records because we have two more cores," he said. Overclockers haven't had their hands on the new chips for long, and there's a learning curve at the beginning with every new processor, said LeeghoofD. On previous Haswell-E chips, they found that the chip would drop performance when the temperate dropped below a certain point, leading them to heat the chip up a little and get the speed back. The Broadwell-E chips seem to run best at around -110 degrees Celsius. 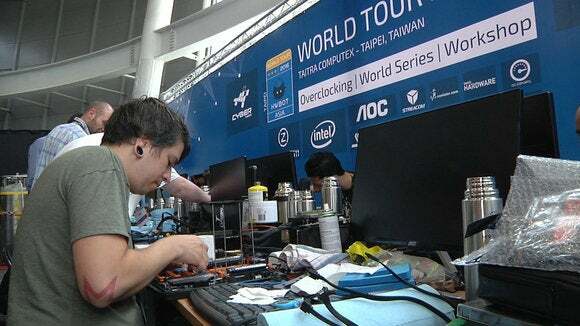 An overclocker works on a motherboard at Computex in Taipei on May 31, 2016. Intel is sponsoring an event where invited overclockers will get a chance to put the new chip through its paces over the course of the Computex trade show, culminating in a championship final on Saturday. "You need to find what's going on with each CPU generation," said LeeghoofD. "It takes some time, so I think today will be more an exploration for people." But once that exploration is done and the engineers have a better idea of the way the chip handles, even higher speeds could be on the horizon.